During the Great Leap Forward in Mao’s China, there was a plan introduced in order to kill four different pests (aptly and creatively called ‘The Four Pests Campaign’). These four pests were rats, sparrows, mosquitoes and flies; they were to be eradicated to prevent the spread of disease and to stop the destroying of crops. This was a huge failure. Documentation shows that this was one of the largest reasons as to why the Great Famine occurred since the extermination of sparrows led to locusts massively increasing in population size as the food chain was disrupted. This led to locusts destroying crops on a scale larger than the sparrows affected stored supplies of grains, corn and other soft agricultural food items. The connotation here is a bit crude, I must admit, but one that has some pertinence: potentially well meaning policy to protect people can go entirely the wrong way. QZ released an article on Friday explaining that Trump’s trade policy has had wildly the opposite effect of what the US president has expected it to have, with China hitting a record $34bn trade surplus with the US this month. I’m not sure how well this will go down in Washington, with this being one of Trump’s leading policies – that is, if the policy was to less China’s surplus rather than affect demand for Chinese goods to the rest of the world. If the latter is the case, then the policy is actually going rather well since RoW Chinese exports have decreased while US exports have increased by a fair whack. The quote from the article above speaks about there being a headwind to the Chinese economy – the slowdown in Chinese credit growth. This may be the case, but I do not think that there is anything for the Chinese government to worry about just yet. Take a look at the below chart. This shows the 3M Shanghai Interbank Offered Rate. It’s the equivalent of LIBOR although less used on the international stage as a tool of pricing of some assets. Something to notice is that China has been easing pretty stealthily since the start of 2018; this was when Trump put his first tariff on Chinese solar panel imports. PBoC easing was absolutely a direct response to this. You can see this from the USDCNH relationship too. A cheaper Yuan pretty much counters Trump’s policy on Chinese trade since goods become relatively cheaper… the party is likely to be short lived for the PBoC though. But that is irrelevant in a world were the Fed are so adamantly shedding their own holdings of the US government’s debt, which is the main reason as to why yields have spiked and emerging markets have been under the cosh. It’s also relatively a pointless remark to make since if China dump them all then they have 0 leverage at all. You only have to look at the positioning of traders on US treasuries to see that Fed rate rises are the reason as to why everyone and not just China have sat on the offer of US treasuries through 2018. Late October 2017 is when we saw the temporary net long position (green line) start to turn long term net short. This coincided with the Fed beginning their aggressive balance sheet shedding policy, and the USD liquidity issues that we see now. The pertinence of this can be shown below. 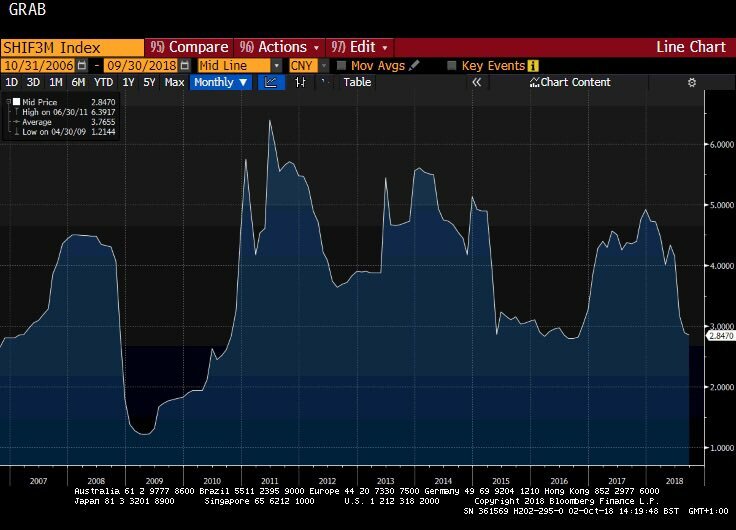 That is 3m USD LIBOR. The upticks (monetary tightening) actually began in 2015 with the end of QE, but the effects on the dollar began later when the rate hike cycle began and increased in velocity when the Fed started to allow their bonds to mature. Naturally, this leads to the current uptick in yields – something which has affected the EMs hugely since they are laden with cheap USD denominated debt through the QE years. Remember, LIBOR shows the cost of lending between each other and therefore, LIBOR can be a proxy for global liquidity and the corresponding creditworthiness of the interbank market (SOFR is too new a contract for me to have any thoughts on yet). 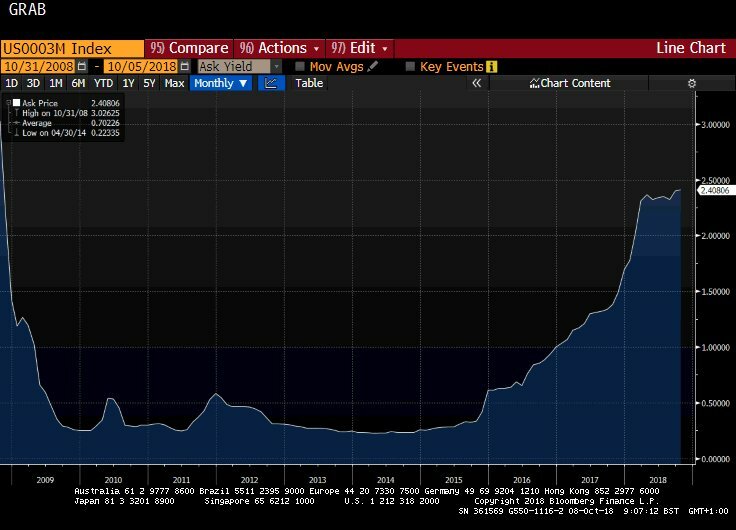 The LIBOR/SHIBOR spread is increasing, and this ultimately means that with the geo-politicking that is currently occurring we are likely going to face a tough reversal at some point where both parties find that they can no longer withstand the policies going either way (easing vs tightening). By then, Trump’s trade policy will be thrown in the dirt and will not matter one bit. I see China going first – they cannot survive 305% debt to GDP. It’s untenable. But so is the situation with USD. Mehul Daya, an analyst who I think is absolutely bang on with the USD fundamentals, of Nedbank in South Africa reckons that the USD is about to face a collapse once a real risk free rate of return comes back… that is when r > CPI. He refersto it as ‘the straw that will break the camel’s back’. However, I see it being made up of two factors – the first being that USD funding issues makes hedging too costly so assets are hedged in other currencies (I do not know which ones as I am not that smart) and the second being the issue Mehul raised. This will lead to decompression of risk assets and a massive repricing/rebalancing of portfolio risk. This in turn will mean a collapse in US yields and therefore the dollar, probably to levels seen when we began QE in 09. So does Trump have a headache? Yes, but the answer is much closer to home for him, and that is with the hawkishness of Jerome Powell. As we know, last week Trump has a bit of a dig at Powell since he knows that Fed tightening is at odds with his China trade policy. I personally think that Trump knows the Fed has created this illusion of a strong economy. Zombie companies have not gone under since their operational costs are kept low through cheap credit and low (but now rising) financial costs and so unemployment stays low… but so does investment. This is a surefire reason as to why Trump is so averse to Fed hiking, and is (again in my view) the real reason why he may need something a bit stronger than paracetamol for the inevitable migraine he is going to face.